1. Whisk together almond meal, protein powder, baking powder and cinnamon. Slowly add almond milk (and stevia if desired), stirring until combined. 2. Pre-heat a griddle or cast iron pan, greased with a little coconut oil. It's ready when a drop of water sizzles on impact. I topped mine with a little smear of peanut butter and a drizzle of maple syrup (also known as the best combo ever.) Hooraaaaaay breakfast! Quick disclaimer: Check with your doc or RD if you want to try something like this. If you're easily triggered on the Diet/Eating Disorder front, a juice fast is probably not for you in this moment and this post may not even be for you. To clarify on my end: some weight loss was a SIDE EFFECT and NOT A GOAL of my juice cleanse. If I don't have hypoglycemia I'm about as close as it gets. I've got a 15 year history of disordered eating = a really firecracker combination of restricting/bingeing/restricting. Throw in my weekly workout and teaching schedule? Forgetabouuuuudit. But when my (very trusted and absurdly adorable) nutritionist, Dori Friedberg of Healing Thru Food, recommended it to help jumpstart some healing for my skin and gut, I agreed to try it. The first couple days of pre-cleanse (just smoothies, salads, fruits, veggies) did not bode well. I sent her a frantic email on the day before I started juicing full time. It went something like "AM ALREADY STARVING! PLS SEND TORTILLA CHIPS IN BULK." The response was very calm: "You've got this. Don't let yourself get hungry. Drink TONS of juice." I was completely surprised, that she was right. I drank 16 oz of mostly vegetable juice every 3 hours or so and felt *amazing. * I wasn't hungry. I didn't have cravings until toward the end of day 3 when I knew solid food was in sight, and I was mostly craving the experience of chewing fresh fruits and veggies. The most remarkable results of the cleanse were completely unrelated to the (mostly temporary) weight loss I experienced. My thoughts and processes felt clear and unhindered. My blood sugar was pretty consistent because I was drinking juice so often, and there was no sugar/gluten/dairy/bleh anything to gum up the works. I was *insanely* productive!! The following week proved to be quite trying on a personal and professional front, and as I stuck with a "solid food cleanse" nutrition plan, I found myself able to experience and process my emotions in a really amazing way. When the body is clear and clean, it acts as a beautiful conduit. I could simply enjoy what I was consuming without worry or planning ahead. I tend to be a planner when it comes to food. Because my schedule is so wacky and I can't afford to eat at the Co-Op every time I gets snack, I have to pack food, plan for blood sugar lows and ensure that I have enough calories to get me through 8 hours of teaching some days. On the juice fast? I only had to make sure I had a cooler and some juice. I was never thinking 'Hm. I wonder what I'll have for dessert? When is dinner again? Should I eat more in case I'm hungry later?' I just enjoyed what I was drinking and knew my next juice would be ready when I needed it. What a blessing to live in a present, abundance mindset! I learned - once again - that I'm capable of more than I think. They say we'll keep getting a lesson over and over until we learn it. And whether it's my SFG prep, moving across the country or juice fasting for 3 days, the lesson has recently seemed to be: You are capable, strong and sufficient in this moment. My plan is to do a 3-5 day juice cleanse 2 times/year or so. My skin was a little dry from lack of fat and we - obviously - can't live on juice especially when training. There's something, though, about a straight shot of vitamins and enzymes to the brain! After going back on solid food, I found myself kind of missing the simplicity and the clarity of the previous week. Eating pretty vegan and pretty "clean." No meat, litte-to-no dairy, sugar or gluten (cards on the table: this weekend was sort of an exception on the dairy/gluten/sugar front and I feel like a$$.) I LIKE eating plant-based and I really LIKE how I feel when my system is free of the stuff that seems to slow me down. This is in NO way a diet and I'm leaving myself plenty of wiggle room, so it doesn't feel restrictive at all! Mostly liberating, really. Share your juicing experiences, questions, comments, complaints and general existential experiences in the comments!!! Combine flour, flax seed meal, baking soda, and salt in a bowl. In another bowl, beat coconut oil and honey until smooth; add egg replacer or egg and vanilla. Stir flour mixture into wet ingredients until dough is just combined. Fold oats, chocolate chips and coconut into dough. Shape dough into 1 1/2-inch balls or drop by heaping tablespoonfuls onto the prepared baking sheets about 2 inches apart. Bake 10-12 minutes or until slightly browned on the edges. Cool on the baking sheet for 10 minutes; transfer to a wire rack to cool completely. This will be quick. But so are these hacks. PROBLEM: Canned Beans. I got really tired of using canned beans because of the BPA in the lining, the icky feeling every time I used a can and tossed it (in the recycle bin, but still) and the $1.89/can for Organic Chickpeas. HACK: Cook dry beans in the crock pot. Soak beans overnight. Rinse and dump in crockpot. Cover with water or stock and add a bay leaf, garlic, whatever. Cook on low for 4+ hours. Cool them and store in 1.5 cup servings in your freezer. Thaw when you need them! Black beans are great cooked with salsa, chickpeas with garlic and lemon for hummus and kidney beans are a chili staple around here. PROBLEM: Chicken stock -- also in cans or tetra packs, also expensive. When you cook a chicken, save the bones (they freeze super easily.) Throw them in the crockpot with 8 cups water, a carrot, the leafy tops of celery, large chunks of onion and a bay leaf or two. (I save my veggie odds and ends also in the freezer for this purpose.) Cook for 8 hours on low. Freeze in old peanut butter jars that you've saved and rinsed! My kale gets wilty before I can use it all in salads or sautés sometimes...and it's not cheap this time of year! Curly kale freezes *beautifully! * Rinse, dry well, tear the leaves off the stems and store in a zip lock bag in the freezer. Seriously perfect to add to a smoothie! PROBLEM: Need a perfectly cooked chicken at 4 pm. I use a whole chicken to use for a couple of recipes and some stock...but because of my evening training schedule, I don't always have time to wait while he roasts up golden brown. HACK: Stick that bad boy in the crock pot. PROBLEM: I don't want to do the dishes. HACK: Leave them for tomorrow morning. What are your kitchen quick-fixes to save time, money and sanity?? This post isn't about meat or no meat - that's something most Americans will never even discuss. This is about making choices that support farmers and distributors that promote the humane treatment of animals, rather than blindly consuming what's most easily available on your grocery trip. 2. Local Harvest Real Food. Real Farmers. Real Community. The best thing you can possibly do is purchase your meat directly from a local farmer who practices humane, animal-centered farming. We're planning on getting some next year from a family member, and any "special occasion" meat (like brats...it's Wisconsin after all!) I purchase are bought from my local Co-Op. I get to ask about the farm and the animals there... they even have farm tours on a regular basis! I have not yet found a local farmer for chicken, and I started buying Coleman Organic Chicken at Costco because it was a budget-appropriate choice for non-"steroid chicken" (as my roommates and I used to call it.) Since chicken is pretty much the only meat we eat (sorry hubby), I decided to research Coleman to ensure that they didn't practice de-beaking or caging... and was so pleased to find that they're a leader in providing happy chicken in the larger market by working with small farms who treat their chickens humanely! Check out my article over at Sun Warrior.com!! In an era when most of our food is shipped across the country—if not across the world—local farmers’ markets are a weekly oasis of brightly colored fruits, veggies, and flowers grown just a few miles from home. The process of shelling before eating will slow you down (it's the pistachio effect!) if you tend to be a mindless snacker, and this protein-filled snack will stave off sugar cravings and is as high in iron as a 4-oz chicken breast! Can I just start with how much I love Pinterest (follow me!) ? JUST when I think I've seen it all... BAM. Angry cat is having a tryst with the adorable dog from Virgin Airlines. 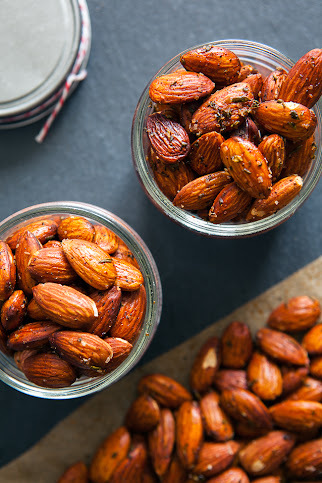 All that aside, this recipe for sea salt and rosemary almonds is seriously amazing! Trader Joe... my dear friend... I could nosh on your organic string cheese along side an apple. With a sliced pear. Or sliced with a plate of organic turkey breast, carrots and hummus. What are your favorite summertime snacks?! Prep cooking is one of the keys to success for all weight loss and muscle building efforts... probably THE most important thing you can do to ensure your own success. But how do you turn 1 meal into 4 without a magic wand and some fireworks? Easy. Using this method - I'm gonna recommend olive oil instead of butter - roast a whole, organic chicken. Steam 2 bunches of asparagus. Steam 4 servings of brown rice. Pull chicken from bones when cool and store in airtight container in the fridge. Toss some chopped chicken and any remaining asparagus with organic baby spinach, and top with 1 oz goat cheese crumbles and 2 Tbs slivered almonds. Mix remaining chicken with 1/4 cup organic tomato salsa and reheat in a non-stick skillet. Mix remaining brown rice with 1/4 cup organic tomato salsa and reheat with 1-2 Tbs water in a small saucepan. Top with chicken, leftover spinach from salad, salsa and some greek yogurt! What is your favorite way to stretch one day's cooking for a week?? They say the way to man (or woman's!) heart is through the stomach. We agree!! What are you getting your significant other for Valentine's Day this year?? As you push forward in setting goals and objectives this year... here's something to consider -- California came in 22nd this year in America's Health Rankings and 5th in Obesity Rankings...but the trend is upward, as it is all over the country. The graph below shows - as we all know - that obesity is on the rise in California and across the nation. And it's time to take a stand for our health! The question is - what are we going to do about it? The answer is simple, but not easy. As Daniel Duane so eloquently pointed out earlier this month in his article "Everything you know about Fitness is a Lie" -- treadmills and weight machines are making us immobile and bored. Movies and books such as Hungry For Change, Food Inc. and In Defense of Food are exposing the facts that "low fat" diets, low calorie foods and the diet industry at large are making us fatter and increasingly unhealthy. So if what the paid media feeds us about the next great workout fad and diet craze that will give you those flat abs is a lie..... then what? 1. Body Awareness Humans, as a species, have shut down our body/mind connection in the name of hard work, efficiency and convenience. If we're going to take back our health, the first step is to get back into our own skins. Notice that packaged, processed foods and hours on a treadmill make us tired and sluggish. Be aware of just how good a Yin Yoga class can feel to an immobile, desk-bound body and how much energy an organic, veggie-packed salad brings! 2. Home Cooking A few amazing, healthy restaurants notwithstanding, you are taking your life in your hands by entrusting your nutrition to companies and restaurants that make money by feeding you foods that make you want more. Learning a few, basic cooking techniques - like roasting a chicken, putting together a salad or making soup! - is what will save our nation's health. Read a blog, ask for help and make some mistakes. Health home cooking could save your life! 3. Happy, Natural Movement I choose to use kettlebells and vinyasa yoga to move because they mimic and expound on our most basic movement patterns: pick up a heavy bag or box. push a child on a swing. twist around to look at a beautiful sky or roaring ocean. You out there? Find something that makes you happy! Leo Babuta has a beautiful philosophy on fitness -- pure, childlike movement. Find something that makes you feel that good all the time. Personally, I spent years trapped in fad diets, on the Stairmill and out of my own body. My journey to health has been such a blessing, and I truly hope that this year is an amazing step in your own process and progress. Love the learning! Love the "in-between" times! Love yourself exactly as you are... and love yourself enough to care for your body for years to come. Low Calorie Sugar Free Holiday Drinks! Found 2-for-$4 at Safeway today ... a calorie free way to indulge in holiday cheer! Looking for other ways to keep holiday sugar cravings in check? PULSE offers FREE Fitness and Lifestyle consultations at our location near Sunnyvale, Santa Clara and Mountain View! 1. Cook quinoa according to package directions, using broth instead of water. Set aside. 2. Cook lentils according to package directions, using broth instead of water. Set aside. 3. Toss apples, butternut squash and almonds with thyme, rosemary, juice and oil. Add lentils and quinoa, add salt and pepper to taste...and enjoy! Would also be great with dried cranberries or currents tossed in (we just didn't have any on hand) or as a base for some yummy turkey leftovers! If you're around, don't miss our TURKEY BURN 2012 Thanksgiving Workout in Sunnyvale! We'd love to see you, your family and your friends...just bring a donation to Second Harvest Food Bank and burn some holiday calories!! Healthy Living eBooks For Less Than $1 Each! For $29, Keeper of the Home has bundled 34 Healthy Living eBooks worth over $300! If you're looking for healthy meals, holistic housekeeping and gardening, beauty and more, don't miss this deal that ends Nov 2nd. There's also a drawing for killer prizes! Off to buy mine now!